Los Angeles (AFP) - NBA officials are investigating whether any tampering rules were violated following reports of the Philadelphia 76ers' Australian star Ben Simmons seeking a meeting with Los Angeles Lakers president Magic Johnson, ESPN said Monday. "He has taken interest in chatting with some of the game's all-time greats and we're supportive," Brand told ESPN. 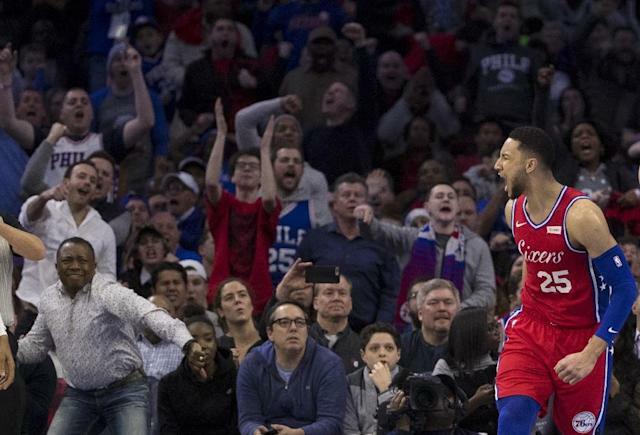 "I said, 'Hey, you've got to clear that with the league,' and if everybody -- the Sixers sign off, we sign off, the league signs off -- fine, I will do that," Johnson said. "I love his game. I love his vision. I love also, too, he's very, in terms of basketball IQ, very high." Brand said he spoke briefly with Lakers general manager Rob Pelinka on the subject and knows Simmons's agent, Rich Paul, is a long-time pal of James, but isn't worried about any tampering, even though an NBA spokesman told ESPN the league is looking into the contact between the Lakers and Simmons. "No issue," Brand said. "I have a great relationship with Ben and Rich and we expect him to be a Sixer for a long time. "I had brief dialogue with Rob Pelinka, who I've known for a long time, but nothing is planned. Our collective focus is on making a post-season push. The Lakers were recently in talks with New Orleans for another of Paul's clients, Anthony Davis, but no deal was struck by last week's trade deadline.